AutoForm Engineering Inc., USA, Troy, MI, announced the release of Auto-Form software version 4.2. This version integrates process layout and tool-cost calculation into the AutoForm product suite. A major new tooling feature centers around the hydroforming process with the definition of preforming tools. The concept significantly improves part quality, increases manufacturing efficiency and reduces tool wear, according to company officials. Other hydroforming enhancements in the new version include new stage-concept definition. Increasing complex part geometries often requires the preform forming step after the bending and before the hydroforming process. 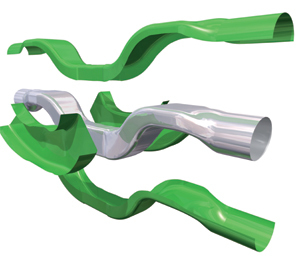 Version 4.2 provides stage-concept definition for the hydroforming process starting from bending and preforming to hydroforming. Other major enhancements in v4.2 include accurate OneStep-based flange development, more efficient springback compensation and import of various native CAD files.